Ponderosa Golf Club Puerto Galera is not just about the golf....really! Ponderosa Golf Club Puerto Galera is tucked up high on the side of a mountain overlooking the beautiful Puerto Galera. Okay let me try that again. The Ponderosa Golf Club Puerto Galera has been cut out of the mountain, nearly 2,000 feet above sea level. 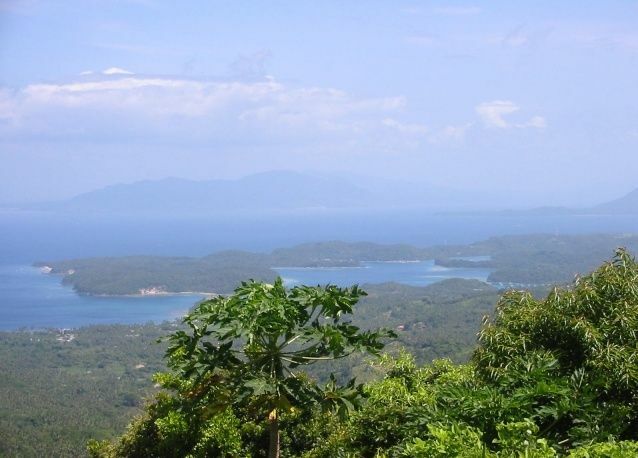 It overlooks the stunning Puerto Galera and in the distance you can see Batangas on the island of Luzon. Still doesn't really capture the beauty, tranquillity and the magnificent views that you are confronted with at the Ponderosa Golf Club in the Philippines. No matter how hard I try and describe it and I don't think I'm doing it any justice at all at the moment, words cannot fully describe what it is like sitting outside the clubhouse in the late afternoon, after completing a round of the par 3, 9-hole golf course. It is not because the golf course is challenging, because it is, well for me anyway. It's not because of the immaculate greens and fairways, well let's face it, they aren't really immaculate. I guess the only way to truly understand what I'm trying to describe is to make the effort and take a trip up the mountain. Where is the Ponderosa Golf Course Puerto Galera? Well if you guessed Puerto Galera, you would be correct! It is nestled half way up Mt Malisimbo, which is south west of Puerto Galera or almost due south of White Beach. No matter what hotel you are staying at, the staff will be able to organise transportation for you. If your staying on Sabang, Small La Laguna or Big La Laguna Beach the easiest way to get there is to get a banca from the beach to Minolo Bay, it will take a bit over 30 minutes. The first thing you will notice at Minolo Bay is the huge marble boulders that have been stacked against the wharf. These marble boulders have been mined from the quarry on Mt Malisimbo. At the village of Minolo a jeepney will take you up the 5 kilometres of winding dirt road to the Ponderosa Golf Club. It is quite a ride and the higher you go the more spectacular the views are. Make sure you have arranged for the jeepney to take you up the mountain to Ponderosa Golf Club, otherwise it could be a long wait for you or a long sticky walk up the 5 kilometres of hill to the top, also get him to wait or come and pick you up to take you back. In the humidity of the tropics walking is not really an option. The lesson here is to book in advance. The club house at the Ponderosa Golf Club is not by any means luxurious. In fact the course itself is what I would describe as quite unique........yes that is probably the best way to describe it, unique. But before we get to the golf course itself, let me come back to the Ponderosa Clubhouse in Puerto Galera. From the clubhouse you have uninterrupted views across the Verde Island Passage and beyond to Batangas Bay and Batangas City on Luzon. Your so high here that the boats look like tiny ants on a blue mirror. In fact even if you do not like golf you have to come here just to enjoy the magnificent view. Make sure, under no circumstances should you forget your camera! If you do you will kick yourself that I can guarantee you. As you can see I do not have many photos posted as yet, so if you have any photos of Ponderosa Golf Course I would love to see them, you can contact me here. The golf course up here at Ponderosa is a 9-hole par 3 course. For a regular golfer, 9 hole par 3 courses are not really worth the effort. True this is not the course for long drives down tree lined fairways, it will however challenge your short game. The Ponderosa Golf Course is cut out of mountain covered in lush tropical jungle. If you hit the ball and miss the grassed areas, your golf ball will be as good as lost, when I say it's jungle, that's exactly what I mean, jungle. You hire all your clubs, balls (lots of them) and caddie from the Ponderosa Golf Club. If Tony is there, he is the owner, ask him for a round he loves to show his home ground advantage off to anyone! Make sure you take some refreshments with you during your round, it is extremely humid on the side of the mountain. You can get your drinks and food from the clubhouse. After your round sit and relax and enjoy the view it is simply magic! One of my fondest memories of Ponderosa Golf Course is not the golf, but the quiet enjoyment of watching the sunset over the South China Sea............life doesn't get any better than that. Now even if you do not play golf I highly recommend you break your trip up from the diving and beaches of Puerto Galera and enjoy Ponderosa Golf Club. Oh and don't forget your camera! If you are looking for somewhere to stay in Puerto Galera have a look here for some of my personal favourites.